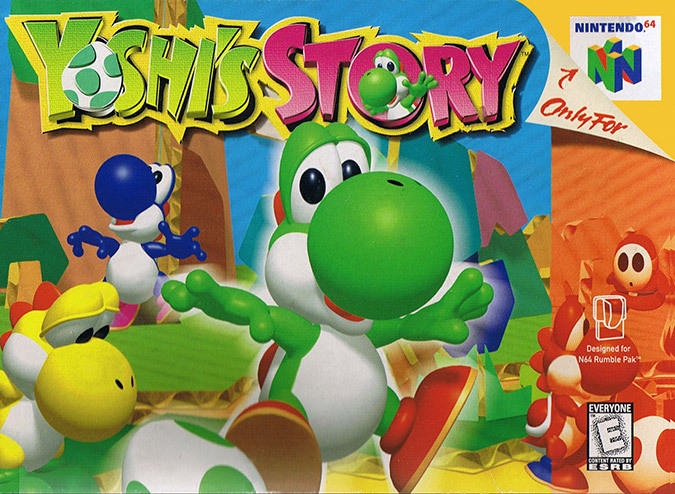 Yoshi’s Story is the follow up to the critically acclaimed SNES game Super Mario World 2: Yoshi’s Island. Unfortunately, it’s not the in-depth masterpiece that its predecessor was. In fact, it’s quite a light experience – one that even critics at the time found disappointing. 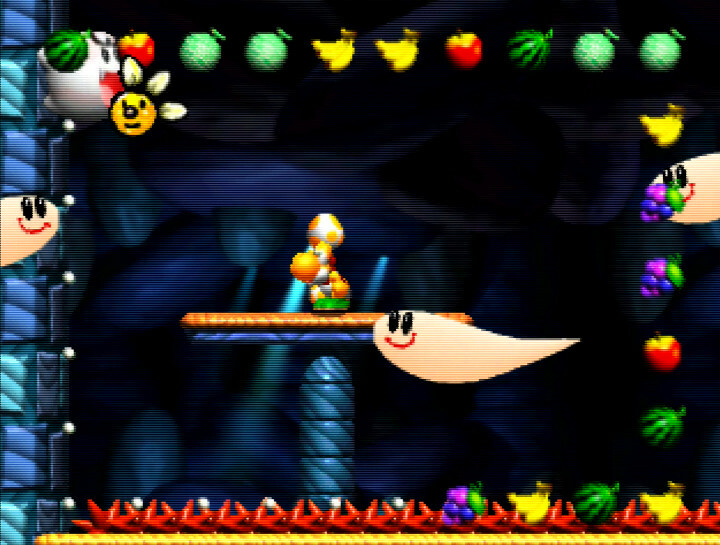 Yoshi’s Story is presented in the style of a pop-up storybook. The plot follows a gaggle of the cute dinosaurs on their quest to reclaim the Super Happy Tree. They must rescue this magical source of Yoshi wellbeing from the evil clutches of Baby Bowser. It’s very clear from the offset that Yoshi’s Story is a children’s game. It’s colourful, charming and simple in every part of its presentation. 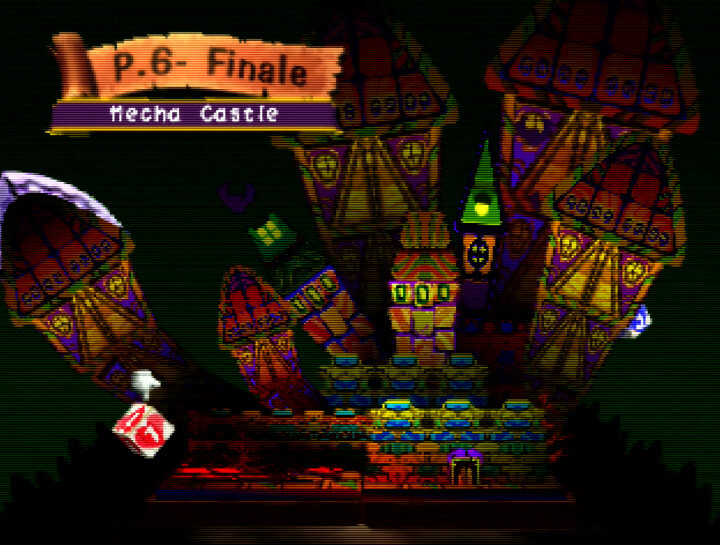 For example, each of the game’s stages is crafted out of everyday materials, such as cardboard and stitched-together fabrics. In between stages, you read the game’s overarching story. This is told through playful language and rhyming couplets – much like an actual storybook for kids. Unfortunately, these moments are a tad torturous, because a chorus of annoying Yoshis sing over the top of it. 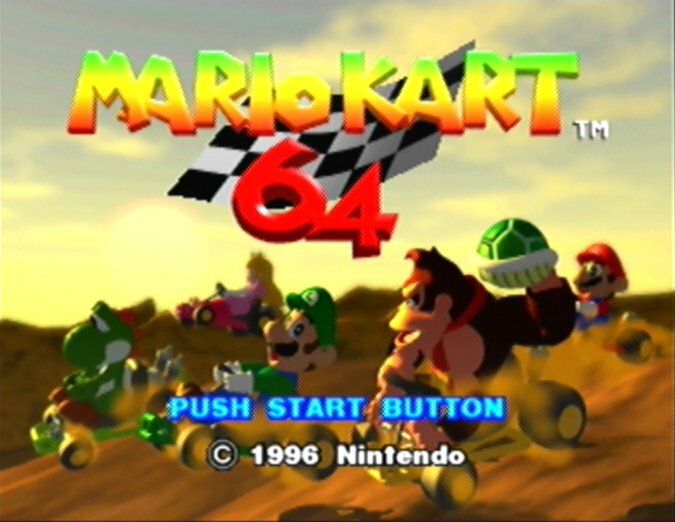 It’s quite possibly one of the very worst audio experiences on N64. 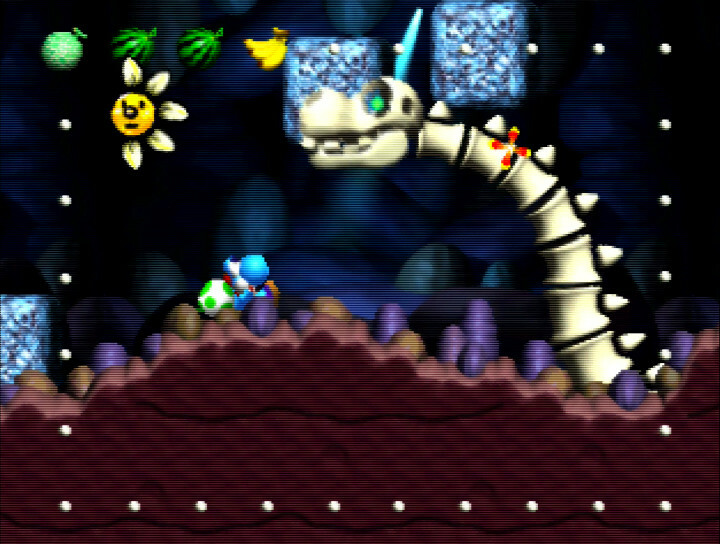 Yoshi’s Story is a 2D platformer with a score-attack focus. 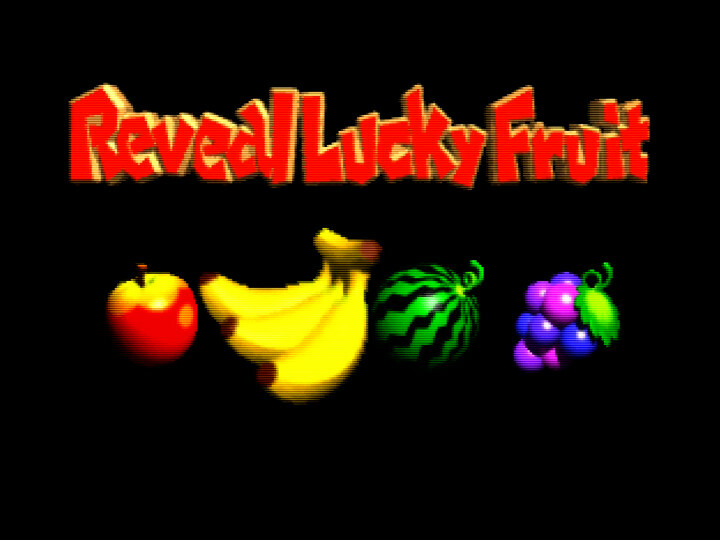 In each stage you have to eat fruit, collect coins and special items, and defeat enemies. 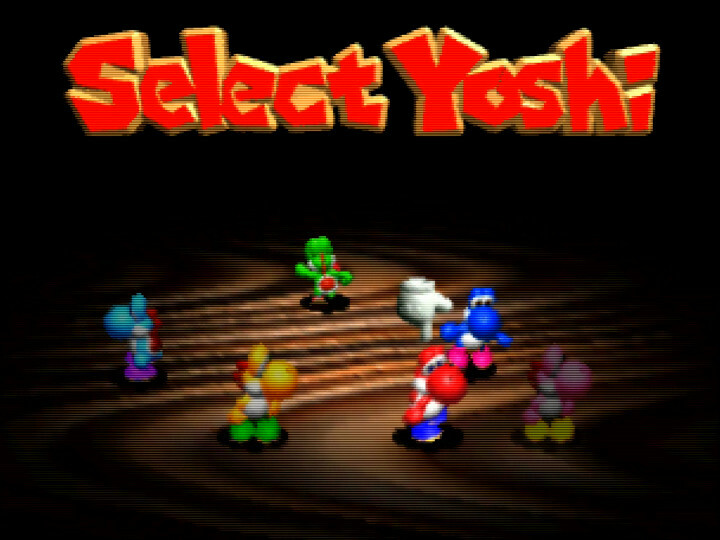 You can play as six different-coloured Yoshis (and unlock two more). The game lets you change between then before each stage. 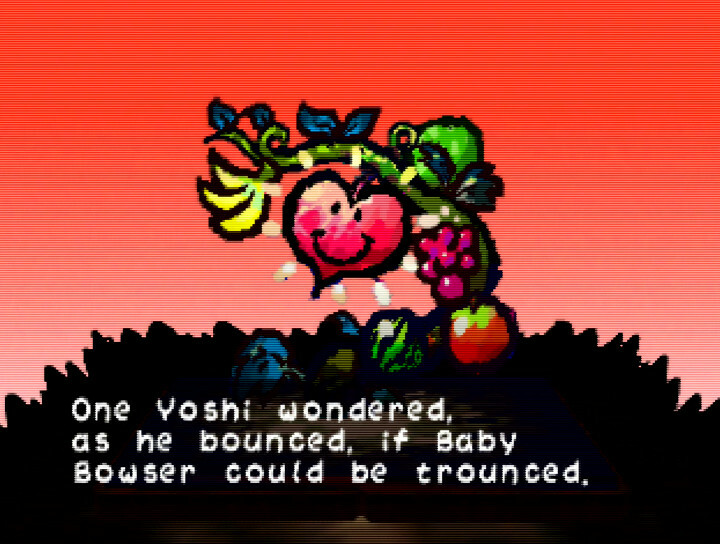 At first this might seem a bit odd, given all Yoshis have the same innate abilities. For example, they can all ground-pound and launch eggs at enemies and objects. Where they do differ (aside from colour) is in their taste for fruit. Watermelons, bananas, grapes, apples – you can eat whichever fruit you like, and you’ll regain any lost health for doing so. But cater to your chosen Yoshi’s taste and you’ll score more points. All Yoshis love melons (different from watermelons). Eat only these and you’ll earn an even higher score. Stages don’t have a physical end point. Instead you complete them by consuming 30 fruits, so it really pays to be a fussy eater. While not a unique concept, this non-linear design gives Yoshi’s Story some much-needed depth. It’s about exploring every nook and cranny to find the best fruit. Many of these collectibles are hidden behind mini-games and light puzzles, which serve as a nice distraction. 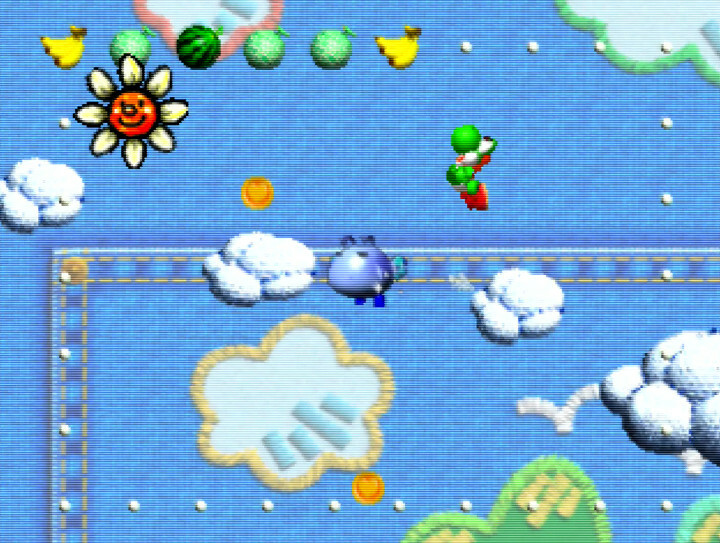 You can also uncover secrets by using Yoshi’s sniff ability. But it’s cumbersome, and you only really use it to determine a place you need to ground-pound – hardly exciting. 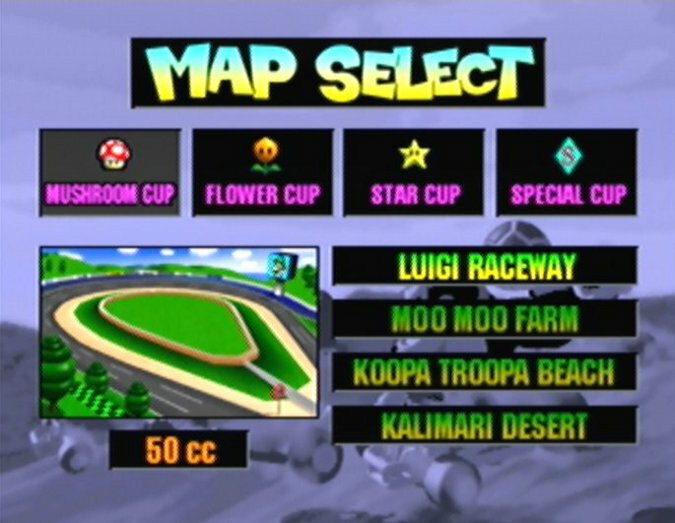 In total there are 24 stages for you to explore. But in the story mode you only ever visit six per play through (one per world). 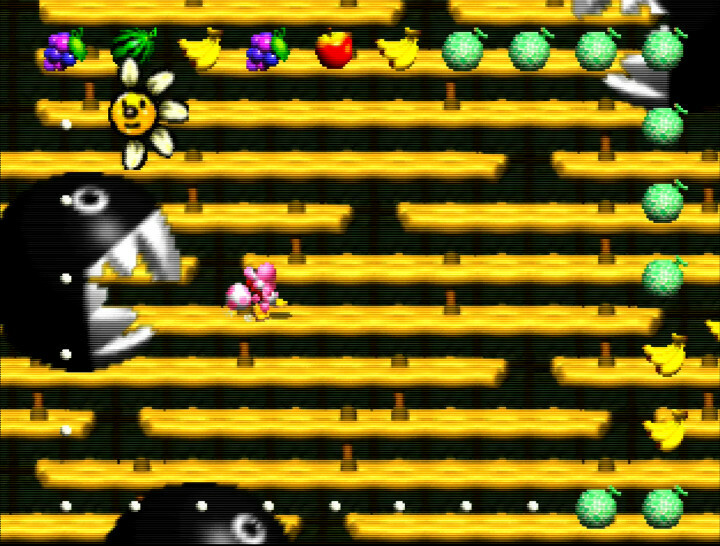 You also need to unlock most of the stages by collecting special heart items. It’s nice that you can choose the route that works best for you in terms of difficulty or high-score potential. At the same time, it’s a very blatant attempt to mask the game’s limited content by artificially lengthening it. It’s frustrating because you can’t skip the story segments in between levels. So not only do you have to watch them repeatedly, but also endure the horrendous music over and over again. There’s a trial mode that allows you to play individual stages without any of the surrounding story bumf. So long as you’ve unlocked them in the story mode. 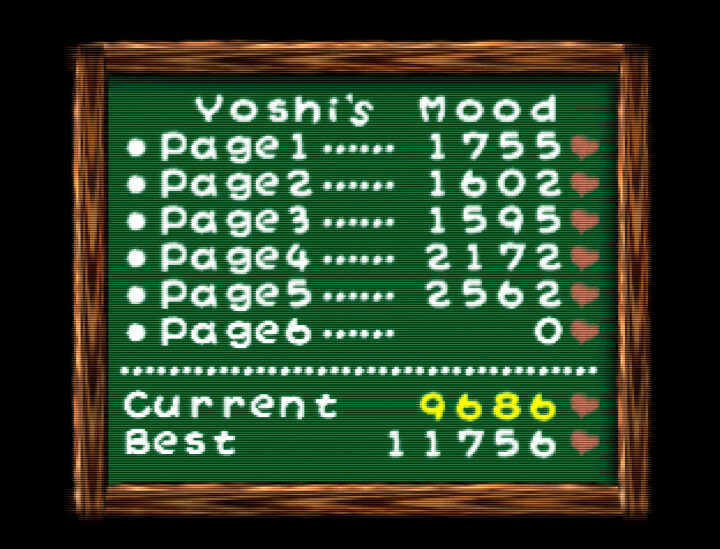 While finding everything is by no means a quick task, Yoshi’s Story is generally a very easy game. There’s little to no challenge in navigating environments, and boss fights are an absolute doddle. In fact, during the final battle of the game you’re essentially invincible. 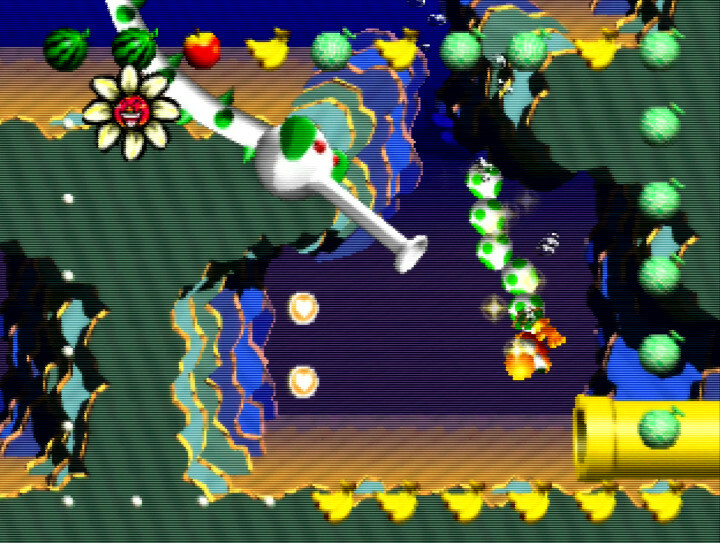 Finding all of Yoshi’s Story’s hidden secrets is more dependent on thorough exploration than demonstrating skill. Unless you’re a fan of easy and laid-back games, you may quickly find yourself bored by the lack of challenge. 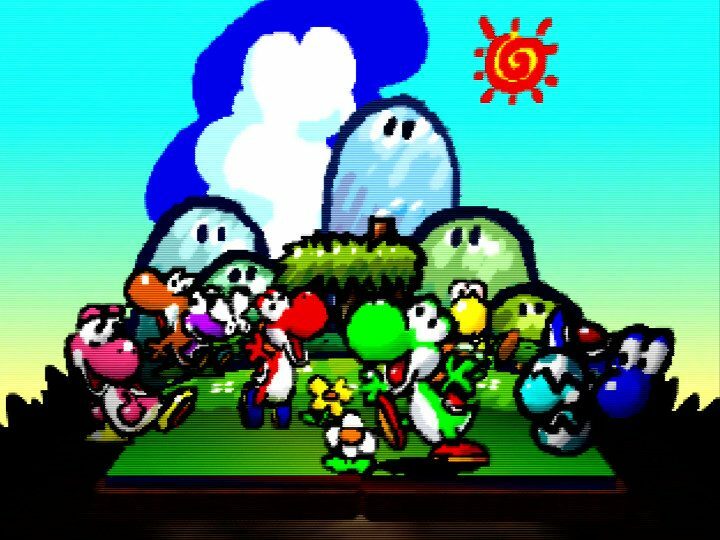 While unconventional for its time, Yoshi’s Story’s art style really holds up a lot better than that of many other N64 games. The environmental textures look surprisingly realistic. 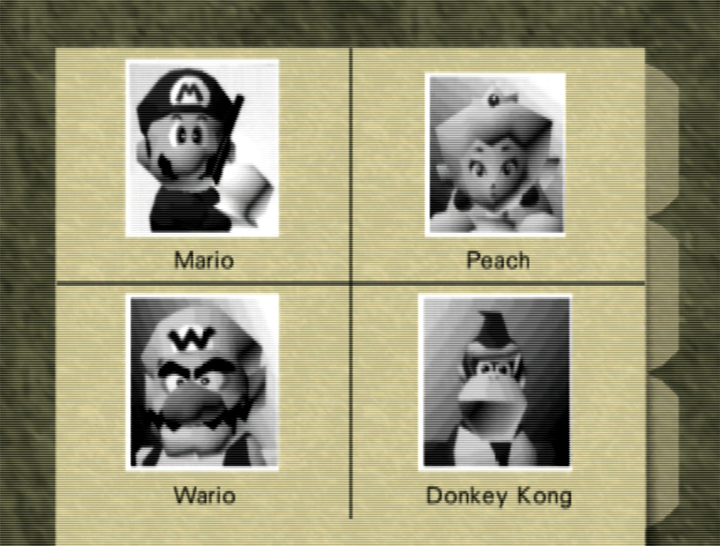 And while the pre-rendered characters are a bit pixelated, they nevertheless convey a lot of charm. 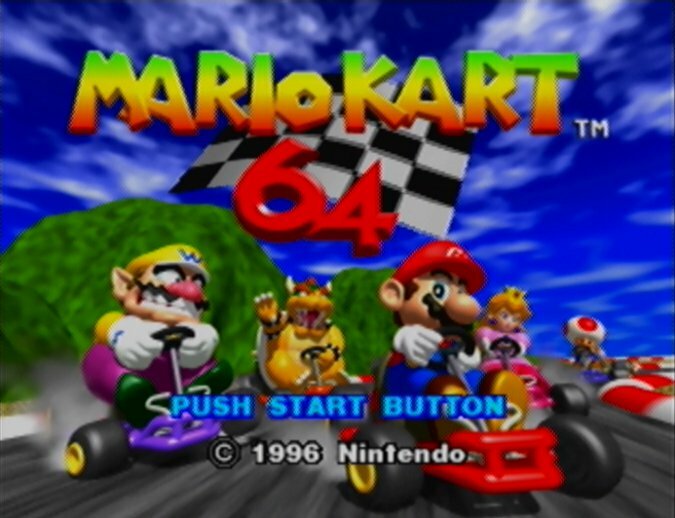 Unsurprisingly, a CRT TV or UltraHDMI N64 (if using a LCD/LED TV) offer the best visual experience. It looks too blurry on a modern TV using standard cables, meaning you lose a lot of the background detail. The only other technical complaint concerns the controls. In particular, the game’s overly sensitive movement, which make it all too easy to miss or overshoot jumps. 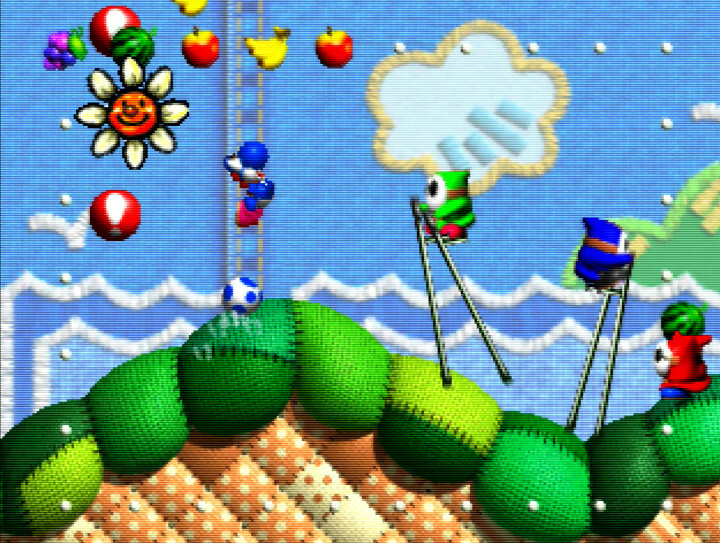 Thankfully, Yoshi can perform a generous flutter jump, which you can often use to quickly rectify a mistake. You move Yoshi using the control stick – the D-pad can’t be used at all. It’s a bit odd you can’t use it given this is a 2D platformer. Despite its visual charm, Yoshi’s Story is a shallow experience. It offers little in the way of challenge and deliberately holds back gameplay content to make it seem longer than it actually is. You have to play through it multiple times to fully unlock everything, which becomes repetitive very quickly. And the painfully annoying music throughout only serves to make it less enjoyable each time. If you’re looking for a relaxing game to dip in and out of, then Yoshi’s Story may scratch that itch. 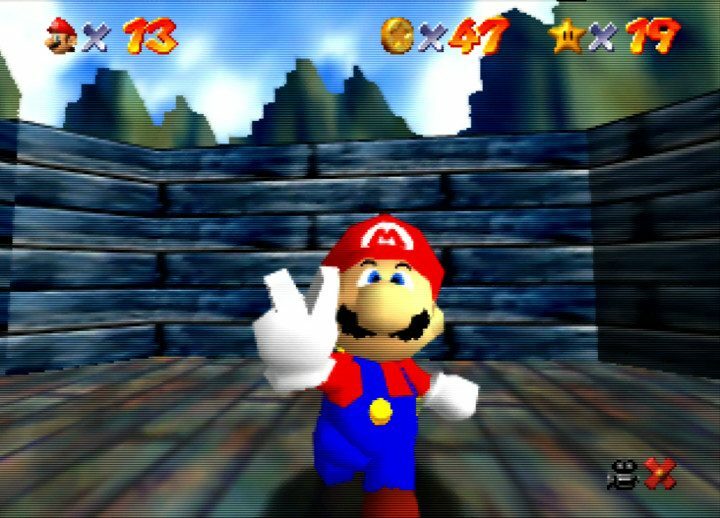 Otherwise there are more exciting, more challenging and more in-depth adventures to be had elsewhere on the N64.